All blockquotes are from Making the Second Ghetto by Arnold Hirsch, except where noted. I think I was mostly confused. I suspect that’s the case for many Americans, of all kinds of backgrounds, who have grown up in a country that has its problems but which, at some fundamental level, works, upon seeing parts of that country that so clearly do not work. It may be paired with pity, or revulsion, or fear, or anger, but at the bottom is confusion, because nothing we know explains what we’re seeing. How can a neighborhood be so poor, so isolated, so different, in a rich country where people regularly move and mix themselves from city to city and state to state? If the ghetto we’re seeing is populated mostly or entirely by black people, which it generally is, we may think about slavery and other forms of racism, but do we really believe there has been enough of that – even since the 60s? – to account for this? And in the North? To see that kind of poverty in rural Mississippi, near farms worked by sharecroppers, is terrible, but produces very little cognitive dissonance. But in Chicago? In New York***? This post was originally supposed to be pegged to the Detroit bankruptcy postmortems, but I’ve been busy, and in any case the phenomenon at hand is hardly that specific. But that was a particularly stark moment, since it called on all sorts of people to recount a narrative of northern urban decline. And pretty much every single one I read said something like this, from the Boston Globe: “Detroit’s deterioration, which started in earnest after the 1967 race riots were among the most violent in the country’s history, has accelerated in recent years.” Or this, from NPR: “In the 1950s and ’60s, the car companies started moving factories from the urban core to the suburbs. Many white families followed, but discriminatory practices blocked that option for black families. As a result, Detroit got poorer and blacker, while the suburbs got richer and whiter — especially after the city’s 1967 riots over race and income disparities.” Searching for Detroit AND bankruptcy AND riots gets you over two and a half million hits on Google. This is something like a Big Bang theory of urban violence. There were always problems in American cities, the theory says. There were pressures. The seeds of disaster. But the riots of the 1960s, when black people looted and burned entire neighborhoods – their own, but no one at the time could be sure they would stay there – was the catalytic event that actually delivered chaos and unchecked violence. It was the moment when ghettoes like Detroit, or the West Side of Chicago, were born. The things I couldn’t explain from the other side of my train window – those are the “scars” (as the preferred metaphor goes) of the riots. Ira Glass On a Catholic church? This American Life, Harold, describing events at a campaign stop by Chicago’s first black mayor, in 1983. Estimates of the Englewood crowds varied from several hundred at the riot’s inception to as many as 10,000 at its peak. “Strangers” who entered the area to observe the white protestors and innocent passers-by…were brutally beaten. 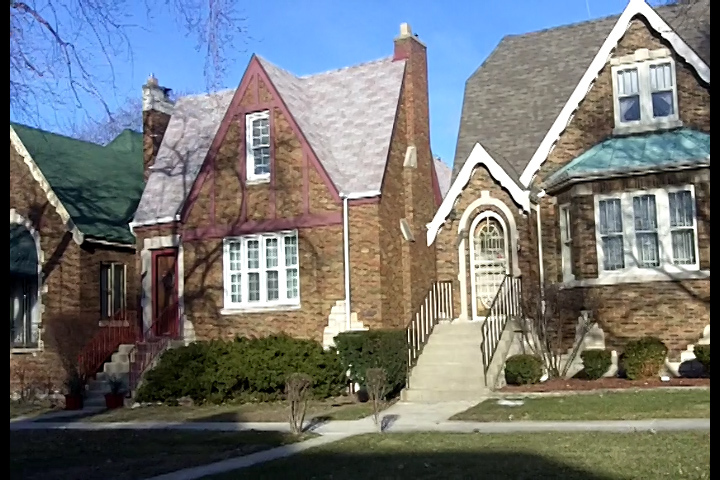 A crowd of 2,000 descended upon the two-flat bought by Roscoe Johnson at 7153 S. St. Lawrence…. They started throwing gasoline-soaked rags stuck in pop bottles. They also threw flares and torches. In Calumet Park, as dusk fell on the scene that saw whites attacking cars occupied by blacks, white handkerchiefs appeared on the antennas of cars driven by whites so that, in the diminishing visibility, the rioters would suffer no problems in selecting their targets. A mob of 2,000 to 5,000 angry whites assaulted a large apartment building that housed a single black family in one of its twenty units. The burning and looting of the building’s contents lated several nights until order was finally restored by the presence of some 450 National Guardsmen and 200 Cicero and Cook County sheriff’s police. When a black family moved to suburban Columbus in 1956, whites greeted them with a burning cross and cut telephone wires. From May 1944 through July 1946, forty-six…residences were assaulted [in Chicago] (nine were attacked twice and one home was targeted on five separate occasions)…. Beginning in January 1945 there was at least one attack every month…, and twenty-nine of the of the onslaughts were arson-bombings. At least three persons were killed in the incidents. But they all happened, and they deserve to exist, at least, in our collective memory. And more than that, the white riots – the 48-hour flash-bang ones, and the slow-burn, once-a-month terrorist bombings – deserve to have as prominent a place in the narrative of northern urban decline as the black riots currently enjoy. Not to make white people wallow in guilt, or even to “blame” them (although those who participated, many of whom are still alive, probably should feel pretty bad about it, if they don’t already), but because any discussion of “what went wrong” that doesn’t mention white violence is just woefully incomplete, and yet that is pretty much the only discussion that we have. It’s like analyzing the causes of World War Two without having heard of the Treaty of Versailles. We also, of course, tell a story about economic devastation wrought by de-industrialization, automation, and offshoring jobs. 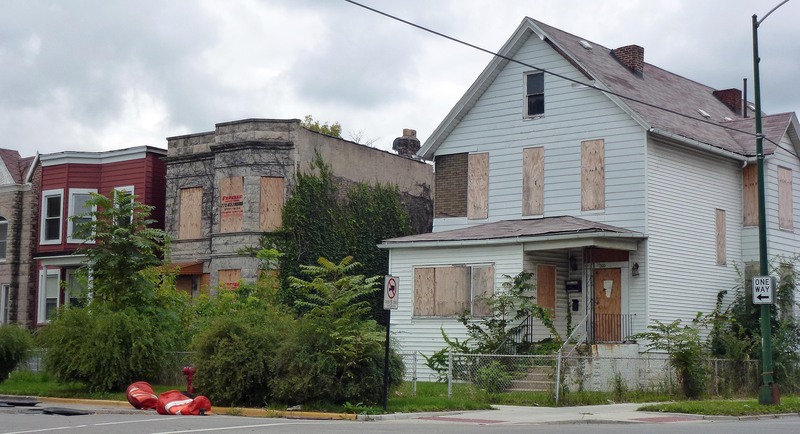 But we never explain why black neighborhoods seem to be overwhelmingly the ones that are decimated, while the white ghetto, as a northern urban phenomenon, is practically unknown. True story: cross-racial comparisons of social indicators like teen pregnancy and street crime that control for neighborhood poverty are impossible in most large American cities, because there are no white neighborhoods as poor as the black ghettoes. But if whites were so freaked out by the arrival of black people that they bombed their houses and even the buses that their children went to school on, maybe it makes sense that they (consumers and bankers) also pulled every dollar out of the commercial life of their neighborhoods when they decided they had lost the battle against their black neighbors. Maybe it makes sense that these places became as shunned and isolated as they did. With this context, the black riot-Big Bang theory of urban violence becomes absurd. In the 1950s – years before Watts, or Detroit, or the King riots – Philadelphia lost a quarter of a million whites. Chicago lost 400,000. Detroit lost 350,000. The scale of the abandonment, as with the anti-black violence, was massive from very, very early on. The web of political and economic and social causes that brought about that abandonment is, of course, extremely complex. I am not suggesting here that white violence was the only, or even overriding, cause. 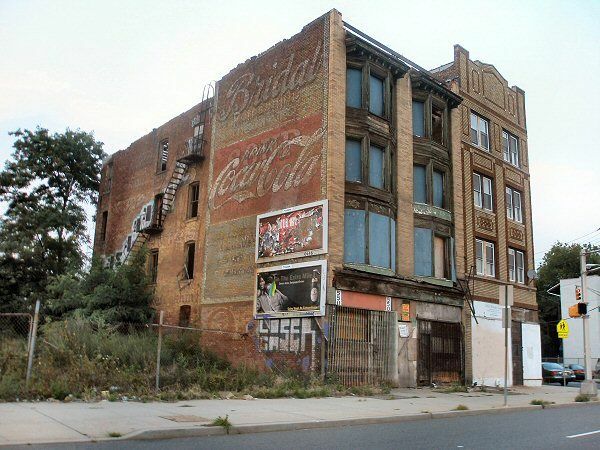 I am suggesting, however, that a conversation about urban decline without it is impossible, both because it was important in its own right and because it illuminates so many of the other causes. As I said previously, this is emphatically not about white guilt; it’s about getting the story right both for its own sake, and for the sake of getting the remedies right. I’ll take up the remedy side at a later date. * I vacillated here between using “a” and “the”; obviously, poor, segregated neighborhoods are tremendously diverse in a large and diverse country, and I don’t wish to portray them as homogenous. On the other hand, especially for the purposes of this post, I wanted to talk about the ghetto as an institution, which exists with certain important commonalities in almost every city in the U.S. So “the” it is. *** These rhetorical questions are meant to be from the perspective of someone who isn’t familiar with the relevant histories of these places, which I think covers most people. But obviously if you grew up in one of them, you are not shocked to find that there is desperate poverty there. I think the notion of white violence as comparable the late 60s riots was more true earlier in the century. The 42 (43?) riots in Detroit seemed to involve a lot of whites suffering under war time housing shortages that were unhappy some of the available properties were going to blacks. On the other hand, the type of violence you describe was more directed towards black families moving in and their properties. I’m not aware of any white burning each others’ houses and businesses down at any large scale. If you want to factor in violence, the previous eras were simply more violent. Both corporations and unions used violence and sabotage in their dealings. This was a sort of white on white violence I supposed, though without the racial overtones. (Some unions today retain that legacy of thuggishness and strike-breakers in certain industries should assume they’ll be subject to threats and vandalism). I no longer live in the rural community I grew up in, for example. Crime and drug use have skyrocketed there as the working class economy collapsed. Yeah, that’s definitely right – I’m not aware of any white riots (at least in the 20th century) whose targets were the stores and buildings in their own neighborhoods in general, as opposed to very specific buildings and people they saw as threats to the racial status of the area. But that almost gives white mob violence an even more powerful position. If white mob violence had taken the same form as the black riots of the 60s, it would be hard to use it to explain what cities look like today, since as I said, there are virtually no urban white ghettoes, at least in the North. But instead, it was designed to terrorize black people to keep them segregated and isolated from white society. And, in fact, it was largely successful at that: racial segregation is still dominant in places like Chicago, New York, Milwaukee, Boston, etc., and whites and blacks still tend to avoid each others’ neighborhoods, and know very little about them. Obviously white violence had a great deal of help in accomplishing that goal, but both anecdotal and academic studies show that places like Bridgeport or Cicero, where the violence was particularly bad, still carry a heavy burden of history for many black people in the Chicago area – and, despite having changed racially in pretty dramatic ways, there are still vanishingly few blacks in either place. I’m pretty much in agreement about your narrative. But I think the “unwillingness of whites to live in black neighborhoods” elides what, exactly, kept black people from integrating, and forced the creation of the ghetto. White people didn’t simply will segregated neighborhoods into existence; they used both the coercive power of the government *and the coercive power of mob violence* to enforce racial boundaries. I think that’s an important thing to include in the story, and unfortunately it almost never is. I think there are more white urban ghettos than you suspect. A lot of the near South Side of Indianapolis (where I lived briefly) is predominantly Appalachian in character, with all that implies. Similar districts exists in other Midwest cites as there was a sort of parallel white Great Migration from these areas to the north. They are different from traditional minority ghettos, but also feature extremes of social dysfunction and persistent poverty. (And of course there were many white urban ghettos, generally ethnic in nature, in the past). That’s interesting. Is there anywhere I could read about those communities? My statement was based largely on people like Robert Sampson, who have said pretty explicitly that when they try to compare, say, academic achievement across race while controlling for neighborhood economic status, there just literally aren’t any white neighborhoods to compare poor black neighborhoods to. But then again, I don’t think many of them were looking at Indianapolis, and maybe they were overlooking some other cities where that exists too. Are there any other cities you know of where that’s a thing? Not just relatively poor white neighborhoods, but very high-poverty, high-crime, very high-unemployment, etc., in major cities? I’m not saying this is a common typology, but there are plenty of poor white neighborhoods in virtually any city as you can easily tell by driving around them and looking out the window. I had a similar experience in the mid 60’s, except it was from the window of a bus and the city was Camden N.J. I was aghast. I was from small-town Florida and had lived in the Washington DC area. I had seen plenty of areas that were poor, but nothing like Camden. The best way was to describe Camden was that it had “gone feral”. Any semblance of civilization had been discarded. I don’t know – I think it’s important to acknowledge how shocking some of these neighborhoods can appear to people who haven’t seen them before, but anyone who’s spent any amount of time in them can tell you that it’s absolutely untrue that “any semblance of civilization has been discarded.” The vast majority of people who live there go about their daily business the same way they would everywhere else, except they have to deal with crime and economic deprivation in a way that others don’t. I don’t think it helps to imagine that the people who live in those neighborhoods are somehow fundamentally different than people who live anywhere else. Perhaps I overstated things a bit. I was trying to make a distinction between merely poor – even distressingly poor – neighborhoods and something that is exceptionally different and worse. As you say, a most poor neighborhoods, life goes on. Kids go to school; some adults work; shopping gets done; there’s movement on the streets, etc. People do their best – even if that’s not saying much. Hardships are suffered and endured. One can only extend a kind of respect for those who can put up with all of this and still carry on. But there are some places that seem to have been abandoned by even the most poor. What little activity to be seen seems to be of a shady nature. Many, if not most, buildings appear to be unoccupied and unmaintained. This is what struck me about Camden. I wasn’t merely poor. I’d seen lot’s of poor places – many of them rural. It was something qualitatively different. I don’t know the right words to describe this difference – but it goes way beyond people just not having very much money. Yeah, I think that’s right – I suspect it has something to do with the poor-but-legal-jobs neighborhoods v. poor-with-no-legal-jobs neighborhoods. But I probably need to read more WJW and Massey before I get much deeper than that.